For decades, Hollywood has been accused of being a sequel factory, and there's certainly an element of truth to this. It's very easy to accuse filmmakers of being lazy and money-hungry, as sequel-after-sequel appear on movies screens and in video stores. Because of this, it seems that people are onto something when they say that the movie industry has no interest in new ideas. Nothing supports this argument like the recent spat of belated sequels which we've been seeing. One could argue that these movies are a product of nostalgia, but it also feels like producers are merely grasping at ideas and that bringing back an old movie is a sure-fire way to make a buck. Does Dumb And Dumber To fit this bill or does it have something new to say. As Dumb And Dumber To opens, we learn that Lloyd Christmas (Jim Carrey) has been catatonic and institutionalized for twenty years and that during that time, his friend, Harry Dunne (Jeff Daniels) has visited him regularly. As it turns out, Lloyd was simply faking. After learning this, Harry decides to visit his estranged parents, where he picks up years of neglected mail, including a postcard from Fraida Felcher (Kathleen Turner) stating that she is having a baby. Wanting to learn more about his daughter, Harry, with Lloyd's help, tracks down Fraida, who informs them that she gave the baby up for adoption. The girl, Penny (Rachel Melvin), was raised by Dr. Pinchelow (Steve Tom), a brilliant scientist, and as he is ill, Dr. Pinchelow has sent Penny to a symposium to accept an award on his behalf. When Harry and Lloyd learn of this, they decide to travel to the symposium as well, so that Harry can meet his daughter. However, Dr. Pinchelow's wife, Adele (Laurie Holden), has grown tiresome of her husband's weakness, so she's decided to stop at nothing to get his money, even if it means killing Penny, Harry, and Lloyd. 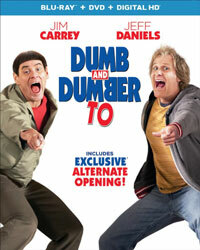 There are certainly some interesting things going on with Dumb And Dumber To. First of all, as noted above, this is yet another in a long line of belated sequels that we've seen recently. Dumb & Dumber premiered in 1994 and became the little film that could, as it propelled Jim Carrey into the limelight. Apparently, Carrey and Daniels had no interest in reprising their roles at the time, and 2003 brought us the somewhat belated (and unjustly maligned) prequel Dumb and Dumberer: When Harry Met Lloyd. Most members of the public had little interest in the film (although it did make a small profit) and I think that most of us assumed that the Dumb and Dumber franchise (if you want to call it that) was over for good. But, here we are, with Jim Carry and Jeff Daniels joining original creators Bobby and Peter Farrelly for an actual sequel. We are left to wonder if it was a burning desire to bring back the characters which brought this film to life or the more probable hope for making some money, but either way, the real Harry and Lloyd have returned. Having said that, the other interesting thing about Dumb And Dumber To is that the story is nearly a carbon copy of the original film. Harry and Lloyd set out on a quest partly due to Lloyd's obsession with a woman. Along the way, they unknowingly dodge criminals while casually wreaking havoc. Sure, we've seen other sequels that didn't stray very far from the formula, but it seems strange that after 20 years, the six (?!) writers attached to this project couldn't come up with an original story. Characters and gags are brought back from the first movie, and the beats to the script are nearly the same. I hate to accuse anyone of being lazy, but that certainly seems to be the case here. So, Dumb And Dumber To is a pointless, unoriginal film, right? Well, those points are debatable, but if you are a fan of the first film and you are in the mood for something incredibly silly, there are things to like about this movie. While it's not as good as the original, there are still talented people are work here and there are definitely some laughs. Carrey is still a master of being incredulous when he is incredibly wrong, and it's always fascinating to see Daniels in this role, especially after watching three season of The Newsroom. Yes, the humor is still incredibly sophomoric and silly, and often Harry and Lloyd show a level of ignorance which is unrealistic, but I couldn't help by laugh at some of their hijinks. If you are expecting a movie to rival the original, you will be disappointed. But, if you are open to a mild "where are they now" update on Harry and Lloyd, you may find something to like. Dumb And Dumber To will have you watching the background on Blu-ray Disc courtesy of Universal Studios Home Entertainment. The film has been letterboxed at 1.85:1 and the Disc contains an AVC 1080p HD transfer which runs at an average of 30 Mbps. The image is very sharp and clear, showing no overt grain and no defects from the source materials. The colors look very good and the image is never overly dark or bright. The level of detail is good (well, it's good for us, we can see the lines in Carrey and Daniels' faces) and the picture has a nice amount of depth. The Disc carries a DTS-HD Master Audio 5.1 track which runs at 48 kHz and an average of 4.0 Mbps. The track provides clear dialogue and sound effects. The driving scenes provide obvious stereo and surround effects, especially when things move from side to side. The musical cues fill the rear speakers. A few scenes, including a car wreck, offer some mild subwoofer action. The Dumb And Dumber To Blu-ray Disc contains a handful of extras. "'That's Awesome!' - The Story of Dumb And Dumber To" (45 minutes) is a five-part featurette which takes an in-depth look at the making of the film. With comments from the creative team and the cast, we hear about the development of the movie, the actors, the cars & stunts, and piecing the film together. The cast nd crew talk about the nature of comedy and how dumb humor works in "What's So Smart About Dumb And Dumber To" (6 minutes). The Disc contains eight DELETED/EXTENDED SCENES which run about 10 minutes. All but one of these is simply a longer version of a scene from the finished film. We also get an "Alternate Opening" (2 minutes) is simply a slightly longer version of the opening as seen in the film. The final extra is a 8-minute GAG REEL.